Click here to get a PDF version of the report. 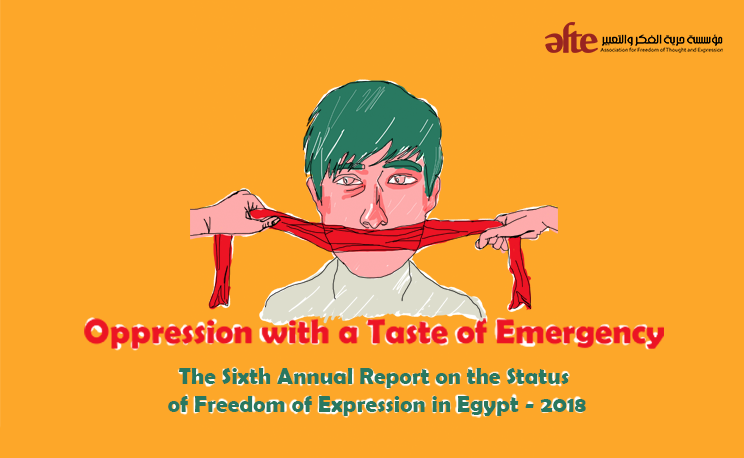 AFTE works to support and promote freedom of expression in Egypt through a number of mechanisms, including providing direct legal support to victims of freedom of expression in Egypt. In this context, it relies in part on case files and information collected through communication between the lawyers of the institution and the victims, or the access of lawyers to cases addressed by other organizations. The organization collects primary data on violations of freedom of expression through a survey of news sites and social networks, monitoring news or publications of activists and users related to violations. The organization relies on the tools provided by the search engine Google and various social networking sites, especially digital spaces that collect the relevant categories of the work of the monitoring and documentation unit in the institution. The Monitoring and Documentation Unit team organizes the initial information collected so that it is classified according to each of the topics on which the unit operates, and this is done as an organizational stage to begin to verify each violation on its own. Official documents: Although it is often difficult to obtain official documents that can be relied upon as anevidence of violations, the organization’s staff sometimes relies on official data from government agencies published in newspapers, news sites, official government websites and government accounts on social networks. Through the Legal Aid Team, the Foundation also works on obtaining police records and legal case files related to violations monitored by the Monitoring and Documentation Team of the Foundation. Testimonies of Victims: AFTE seeks to communicate directly between the staff of the Monitoring and Documentation Unit and the victims from the target groups to document the violations committed against them. The testimonies are obtained either through direct interviews or by phone. Eyewitnesses: If a victim’s testimony cannot be obtained directly from the victims, the team tries to obtain testimony from eyewitnesses, victims’ families or their lawyers. Digital verification tools: The institution relies on some technical tools to verify the images and photographs published on the Internet, especially social networks, to ensure authenticity, especially verification of images of attacks or images of decisions or official data issued by a government agency. Relevant human rights organizations: The monitoring and documentation team of the institution often communicates with other human rights organizations working in the same areas to obtain information about the violations monitored by the team, particularly with regard to legal cases pending in the courts. Multiple sources: Sometimes documentation by verifying the data available to the staff is made from different press sources, particularly with respect to violations against groups, such as coverage by journalists and media professionals. Monitoring blocked sites: The institution relies on monitoring blocked sites in Egypt and to make sure of this through the ooniprobe software, a free software that acts as a network to detect the control and interference in data traffic on the Internet. The tool allows you to perform site blocking tests, as well as another spectrum of network tests, in addition to ensure the website performance by testing it via common browsers or browsers such as Tor. The monitoring and documentation unit organizes violations digitally, which have been verified, including materials relied upon in the verification, data, official documents in addition to direct testimony from victims or their discharge. To protect national security, public order, public health or morals. Security agencies: include the Ministry of the Interior and the Ministry of Defence and regular forces, and also includes attacks by “civilian supporters” or “unknown” in the presence of regular forces. Judicial bodies: include all civil and military judicial institutions. Private Egyptian channels: private channels based in Egypt. Multiple: includes several press or media bodies. Not verified: lack of access to the victim’s institution. Arrest: is the process of restricting the freedom of a journalist and taking him/her to the police section and making a report. A violation: Any violation that occurred to a person in a particular place and time. For example, if three journalists are arrested in a particular incident and one of them is beaten and another is assaulted, five violations will be counted in that case (3 cases of arrest for every journalist, a beating case for a journalist, a case in which a journalist is attacked). However, in the case of collective violation, such as the prevention of coverage, it was considered as a single violation because it was targeting journalists collectively and not a particular journalist, and also because of the problem of determining the number of journalists and their identities, especially that such violations occur almost daily in addition to the statistical problems that will cause an extremely high number of victims. Journalist: Any person who has been subjected to a violation for performing his journalistic work and provides AFTE with proof of his journalistic work as a member of the Syndicate of Journalists or a work permit or assignment to a press institution or press archive or a certificate by the Press Foundation through its media outlets or officials. Press Foundation: Each press outlet that has a website or produces hard copy publications.